Position of gallery item updated. I found this during a random google search, resized it and sharpened it with some mild color/linear burning. Enjoy. nice wallpaper, the charas swords look good and i like the thing in the background too. 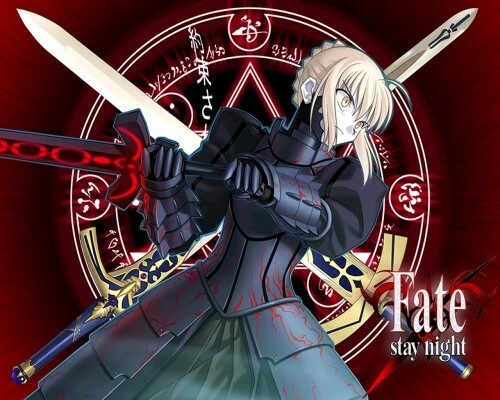 I just love new Fate Stay Night pictures! They're so cool!! !Nice wall it's coooooolllllllll!! Add it to my favs ! Love the sword and background! I like the background of the wallpaper, good job. Keep in mind guys i didn't actually make this wallpaper since it sounds like theres some confusion. Just found it, slightly edited it and posted for enjoyment. You now may return to your regularly scheduled posting. personally, the strong blue outline made saber look flat, especially around the sword area. Otherwise it would of been a very good wp. This is my favorate armor for her. That spells 'we're all gonna die now'! Impressive!